Every blockchain community thinks their project has bad marketing, but that’s because most projects offer nothing unique. Jelurida has something special with the Ardor and Nxt platforms — significant improvements are underway for 2019 and Jelurida will be sure to communicate its most prominent successes regularly through these weekly updates. Ardor is getting an awareness boost with blockchain start-ups in Singapore. Veronica Torras will be providing mentorship to promising new tech projects throughout the 12-week LongHash Hatch Accelerator program. The hype around tokenization is increasing by the day. Alberto Fernandez asserted the Ardor platform’s working solutions for fungible and non-fungible tokens (NFTs) on the Ignis child chain during the RetinaToken event in Madrid. NYC is the heart of global finance and home to one of the world’s largest Blockchain Week programs each May. Skylar Hurwitz met with long-time community member Patoshi on Wall Street to explore opportunities for building Ardor’s presence there. For the third time in the past year, Jelurida’s staff were back at the reputable ISDI digital business school in Madrid to provide learning services to the master’s degree students there. 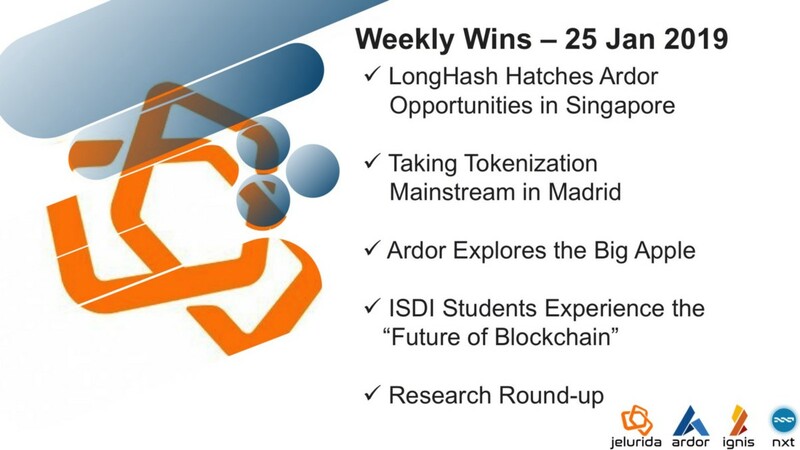 The event featured discussions on the future of blockchain technology and a hands-on workshop on the Ardor platform led by Jelurida’s Alberto Fernandez and Francisco Sarrias. For DYOR to make sense, the sources need to be accurate. Jelurida has been undergoing an extensive review of 3rd party sites with descriptions of Ardor, Ignis, and Nxt and requesting updates. As part of this ongoing work, the team is also surveying websites that track companies in the blockchain space and submitting information. This week, CoinCodex added mentions of lightweight smart contracts to their descriptions of Ardor and Ignis, while Kepler Finance in Switzerland has added Jelurida and Ardor Nxt Group to its company directory.